Fine, artistically-drawn hair strokes that mimic natural brow hair can offer a long-lasting definition that can assist with sparse, thin or over-plucked brows. Individual stokes can be placed exactly where necessary, and pigment is implanted to follow the direction of the natural hair growth, to blend seamlessly with what hair is available, or what would have been present before hair loss. Perfect for alopecia sufferers, microblading can create the most realistic semi-permanent brow designs. Microblading is a popular technique of infusing pigment into the skin using a microblade - a small hand tool comprised of a series of tiny pins. It is sometimes known as 'eyebrow embroidery' or 'micro-stroking', and is a form of micro-pigmentation used to create natural-looking definition to the eyebrows. How do I know if a microblading brow treatment is right for me? Carrina will perform an in-depth consultation for each treatment, lasting between 30-45 minutes. Your medical history will be checked to assess your suitability for the procedure, and the process will be fully explained to you so that you know what to expect. 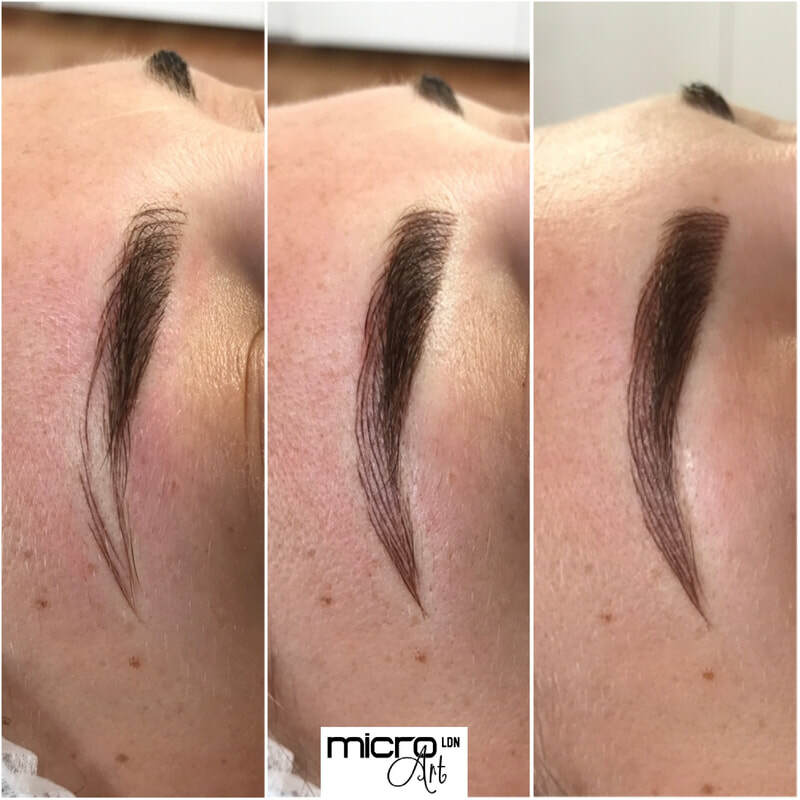 It is a great opportunity for the client to understand how microblading will enhance their eyebrows, and which colour and shapes will best suit them. Microblading appointments are 90 minutes in total, comprised of around 45 minutes consultation/design time and 45 minutes treatment time. A 30 minute refill treatment is included in the price, which is taken 4-6 weeks after the initial application. Before the treatment, a topical numbing agent is applied to the area, to make the experience as comfortable as possible. Clients advise that there is a slight 'scratchy' sensation initially, however the numbing agent is continually topped up throughout the procedure. Harley Street treatments at Hertfordshire prices - visit the Prices page for the latest microblading offer! "I was really really apprehensive and worried about having my brows micro-bladed. I’m not a fan of the big fake looking brows or pain! I just wanted mine to look as natural as possible - but with 1/2 of each eyebrow missing from years of over plucking I desperately wanted to not have to keep drawing my eyebrows on every singe day.